Have you ever wished for a magic potion? I know you have, so have I. I have finally found it, and it comes in the form of a Cleansing Balm. What is that you ask? Basically a miracle of many sorts and it comes with a muslin washcloth! No seriously, Beautycounter’s Cleansing Balm has everything you wished for and more. It is an amazing facial cleanser, eye makeup remover, moisturizer, lotion for dry skin, good for baby eczema, facial masks and more! If I haven’t listed your favorite use for this product, then you need to tell me what you use it for! The Cleansing Balm gently melts into your skin to hydrate it while it cleanses at the same time. The best part is that it never depletes any moisture, I actually feel MORE hydrated after I use it. Vitamin C brightens the skin and raspberry and cranberry seed oil hydrates, meaning it is made to be used as a mask- I wasn’t just making this up. All you need to use is an almond sized amount, and your skin will look fresher than it has ever looked. The price point is a little higher than other Beautycounter products, but because you are really getting 6+ products in one, I would say that $80 is a great deal! Plus, it will last forever so you wont need to buy it again for a while. 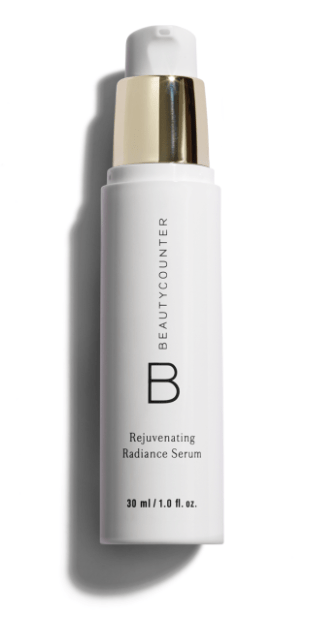 If you’re really looking to brighten up your skincare, I would suggest following with Beautycounter’s Rejuvenating Radiance Serum. This product will even the look of your skin while it hydrates and reduces fine lines and wrinkles. If the Cleansing Balm isn’t your bag, then this should be! Layer this baby under your moisturizer for an extra layer of protection. You’ll thank me when you’re glowing and looking 15 years younger!